We have to hand it to Werner Co.—the ladder manufacturer knows how to get major brand exposure. 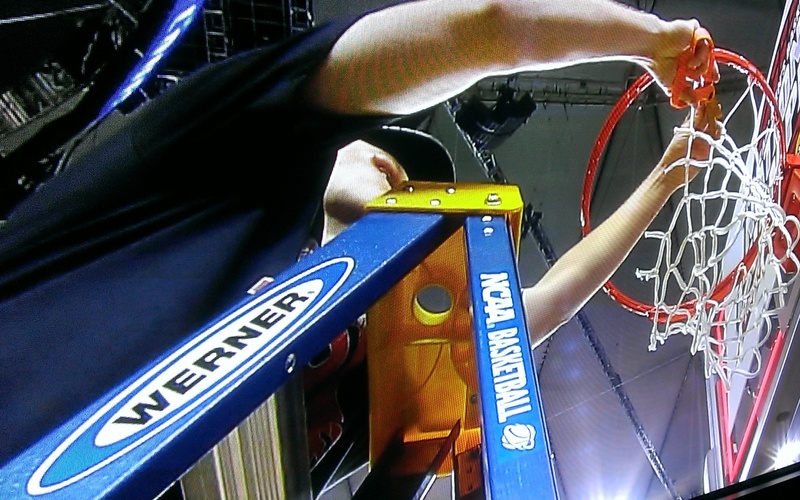 It created a custom, nine-foot stepladder as the official 75th NCAA championship ladder. When Louisville surged ahead to beat Michigan in last week’s NCAA championship game, that ladder gained Werner Co. some impressive exposure. Nielsen estimates that 23.4 million people tuned in to watch the game—a bigger audience than the last two men’s championship games, and easily the most-watched program on primetime TV last week. As if that’s not enough, as the official ladder, Werner Co. was part of the iconic net-cutting tradition. The custom, in which the winning team gathers around the basket and collectively cuts down the net to celebrate its victory, dates back almost 100 years. In the 1920s, the legendary Indiana boy’s high school basketball team would celebrate winning the state title by cutting down the nets as souvenirs. When the buzzer sounds, a ladder is positioned under the hoops and logo scissors (the scissors are, of course, sponsored too) are brought out. “The net-cutting ceremony is a rewarding tradition for the winning team, and we are thrilled the ladder will be part of this unforgettable moment,” Chris Filardi, Werner Co.’s Vice President of Marketing, said in a press release. Louisville took home the commemorative ladder to display for the next year. The ladder is remarkably unique, featuring plaques that highlight each year and the schools that won the tournament dating all the way back to 1939. It was a glorious moment for Louisville, and Werner Co. was right there for it all. With that kind of brand exposure, there’s no doubt Werner Co. was a winner as well. Sponsorship is a way to build prestige for your brand and gain that coveted exposure. Consider using logo signage and custom table covers for immediate visibility, and handing out promotional items to leave your mark on the event. Where Does The Colts Championship Schwag Go?